Master Course in Esoteric Numerology: "Treasure Hunt"
"Each number has its own personal vibration and its meaning, and, when people are open to it, it becomes a" door" on the history of ourselves and of our soul"
This two-days course has the purpose of teaching how to work our a numerology map which reveals the energetic qualities and the talents we have brought into incarnation. The key to access this map is our name and it reveals how we can use our karmic potential, as an intent, in order to manifest our gifts and talents. In this context karma is not negative, but it reveals how, behind the surface of our life, there is a clear intent looking to be manifested and revealed. Each of us is here as an instrument of the Greater Life and what it is truly important is not who we are, but the ROLE we have been given in the Greater Plan. It is important to understand it because it allows us to depersonalize what happens to us and learn to observe it in the greatest context to understand the Love that lies behind it. Through this new map that we are going to learn, we will be able to find out the KEY to the treasure and also to find the TREASURE number: a very important information to the unfoldment of our path. The aim of the Masters Course is to invite our minds to adopt a multi-dimensional level of perception of the qualities of numbers by following their cyclic movements from different perspectives. 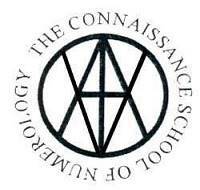 The Connaissance School Masters Course is a series of six standalone modules which will be developed over the period 2015 – 2017. The modules will further develop themes first introduced in the Diploma Course. Each module will last either one or two days. A Certificate of Attendance will be given for each module completed. Students who have completed the Diploma Course and who hold either a Diploma Course Certificate of Attendance or the Diploma, will be awarded the School’s Masters Qualification when they have attended any four Masters modules. Other students are welcome to attend the Masters modules and will receive their Module Certificates of Attendance, but they will need to complete the Diploma Course before converting their four Masters Module Certificates into a Masters Qualification.